In addition to classroom work, each student has two different field placements during the two-year program. Students are assigned to a first-year placement that exposes them to both macro and micro practices, and to a broad range of clientele. The program is structured so that students participate not only in direct service, but in community outreach, advocacy, staff meetings, consultation, research activities, and staff development programs. 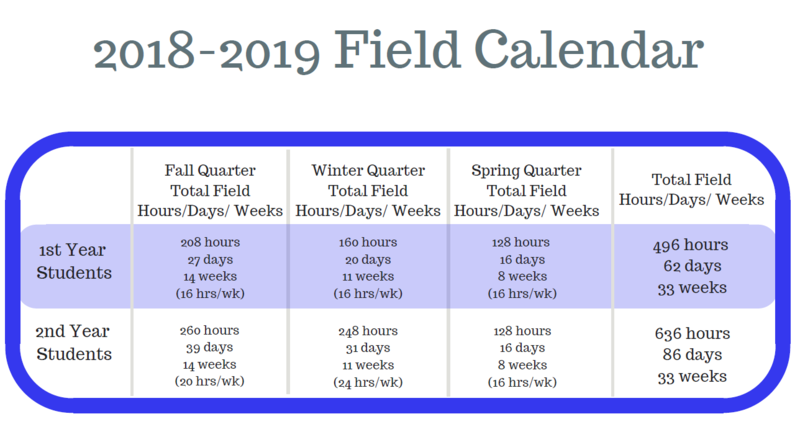 Field days are two full eight-hour days per week for first-year students (Monday and Wednesday) for agency placement, and Fridays for field education modules. The second-year placement is coordinated with a student’s choice of concentration and specialization. Second-year students are in field three days per week (Monday, Wednesday and Friday). Field placements may include evening hours. Approximately 1,100 hours are required in a field placement over the two-year period, for which a total of 21 units of academic credit are given. It is important to note that all MSW students are expected to travel to their field placement. Most placements are located a considerable distance from campus. Because public transportation can be unreliable and time-consuming, access to a car or other reliable transportation is necessary. Reasonable efforts will be made to place students with disabilities in accessible agencies and locations. The MSW is a professional practice-oriented degree that assumes the school and community of social work agencies are engaged together in the education process. The UCLA Department of Social Welfare relies heavily on the practicum and community agencies to help produce competent practitioners. The Department of Social Welfare is an integral part of the University of California, adhering to its established policies. Affiliation with a wide spectrum of community agencies, which may provide suitable educational opportunities for our students is sought. The practicum or field education is a course which must meet University and Council of Social Work Education (CSWE) requirements. The Chair has final administrative responsibility in all matters pertaining to the Department. A signed Affiliation Agreement is required between the agency and UCLA before students can be placed in the agency site. Our Department uses an online application to screen new agencies. Agencies interested in becoming a placement site for the MSW program should submit their application here. We will review your application and contact you as soon as possible. If you have any questions, please contact Carmen Mancha at cmancha@luskin.ucla.edu. Once the assessment is completed, and it is deemed probable that a placement can be mutually beneficial, and member of the field faculty will make an appointment with selected agencies to further discuss the specific arrangements. Click here for a PDF of Field Education Responsibilities. If you are looking for the general UCLA directory, it can be found here. Read more about our field faculty.